Boghosian Raisin Packing has been a pioneer in setting equipment standards for raisin processing – utilizing our own expertise and process innovations to streamline the functionality of our equipment. We operate one of the most modern, state-of-the-art, technologically advanced processing facilities in the world today processing to the most stringent customer specifications. 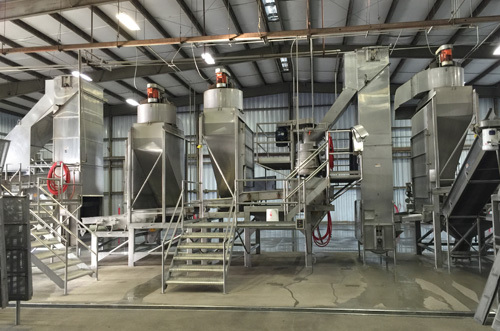 Our raisin processing line is constructed of stainless steel and food grade plastics. We utilize the latest technology in laser scanning, metal detection, grading and processing equipment. We are achieving the lowest defect levels possible in the industry today and are proud we have worldwide brand recognition. Boghosian Raisin Packing Company is serious about ensuring the highest standard of food quality and safety. All employees are educated in and follow strict Federal Good Manufacturing Practices. Our quality team consists of product inspection, sanitation, housekeeping and pest control. USDA inspectors and our staff conduct pre-shift sanitation inspections of all processing equipment prior to each day’s production. Laser scanners and metal detectors are tested routinely and results are documented. After every production run, our sanitation crews perform a thorough cleaning and wash down of the area and all equipment. Electronic surveillance cameras monitor the finished goods warehouse, processing areas and outside grounds 24/7. All processed product is inspected and tested by our team and USDA inspectors continuously during production. Boghosian Raisin Packing quality management also works closely with our customers to develop individual specification and quality control requirements.